Obesity: Does it have anything to do with diet? Coca-Cola and American College of Sports Medicine scientists have attempted to challenge the link between dietary patterns and obesity. This message reached the mainstream media in August. New York Times health reporter Anahad O’Connor broke the story to the press with a front-page feature, Coca-Cola Funds Scientists Who Shift Blame for Obesity Away From Bad Diets. Most of the focus in the popular media and in the scientific press is that they’re eating too much, eating too much, eating too much, blaming fast food, blaming sugary drinks and so on. And there’s really virtually no compelling evidence that that in fact is the cause. But disputing the link between food and obesity was a step too far, even for Coca-Cola science. Ten days later, Blair had retracted the video and released a statement to the Global Energy Balance Network attempting to explain himself. So did the press misrepresent Blair and the GEBN? Did O’Connor take Blair’s words out of context to spin his story? Furthermore, Blair confesses that his dismissal of diet did a “disservice” to his fellow Coke scientists at the Global Energy Balance Network. In other words, it’s his own fault, not the New York Times’. … the University of South Carolina disclosed that Dr. Blair had received more than $3.5 million in funding from Coke for research projects since 2008. 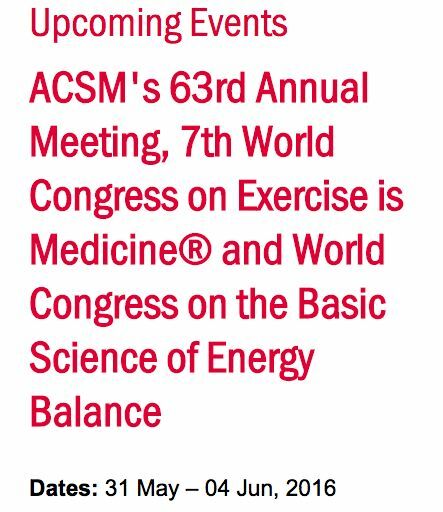 The otherwise excellent press about the Global Energy Balance Network missed a crucial player: the American College of Sports Medicine. Steven Blair, Gregory A. Hand and James O. Hill helped to found the GEBN. The Global Energy Balance Network’s links to the ACSM are extensive. While Hill mentions McDonald’s in this video, not Coca-Cola, he’s still spreading a corporate-funded message – Hill serves on McDonald’s Global Advisory Council. The Global Energy Balance Network has become a synonym for corrupt science, and Big Soda has become the new Big Tobacco. 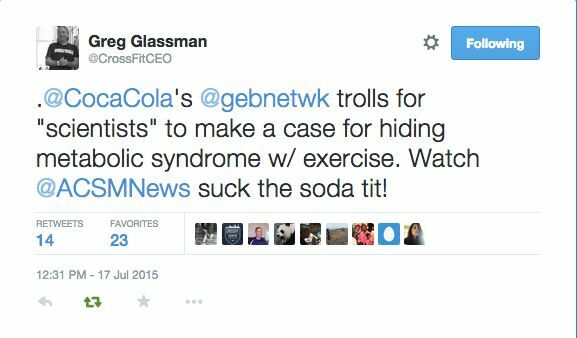 Will the ACSM subtly back away from Coca-Cola and Energy Balance? CrossFit HQ looks forward to attending our second ACSM annual meeting. We hope to see you there.